The teen years can be tumultuous times, and preteens are poised on the brink of entering one of the most delicate times in their lives. However, parents and guardians of preteens can help to smooth the transition by teaching them important life skills before they go through puberty. The first and most important element in teaching your preteens good people skills is to demonstrate them yourself. Kids learn by example, and your example is the one they are the most likely to look to. So it's essential that you demonstrate good people skills so your children will follow your lead. You can also make your children's life a learning-rich environment, giving them plenty of opportunities to learn and practice important social skills. Give your kids plenty of opportunities to interact with all different kinds of people and groups that include a mix of adults, teens and children. Churches, community groups, family centers, musical or performance groups and similar activities all provide opportunities for your children to interact with others in a safe environment. Youth sports will teach them how to be teammates, to listen to coaches and mentors, and how to engage with sportsmanship. To find recreational youth sports in your area, use a locator like Upward, which allows you to search youth sports in your region. Play family games frequently. Interacting in family board games can teach all sorts of social skills, such as conflict management, problem-solving and others. For preteens, consider Awkward Moment Card Game, a game that offers plenty of awkward social situations in a fun and safe environment. Eat dinner together. During this time, emphasize table manners and polite discussion. Likewise, eat dinner with guests and other families, and dine in various situations, such as out at a restaurant or at a friend's house. Before such outings, outline expected social skills and then model them yourself. Grade school children can easily make simple breakfasts and pack a nutritious lunch, and older children can plan and prepare simple family meals. Learning to prepare food not only has health benefits that last a lifetime, but it's a life skill they will need. If your child can prepare simple foods, she may be less likely to turn to packaged convenience foods - especially if you don't keep them around the house. Model healthy eating and don't buy packaged junk foods. Educate yourself. Try a book like Get Your Family Eating Right, which shows you how to teach your kids to establish healthy eating habits. Purchase a cookbook geared toward kids and tweens, such as The Young Chef by the Culinary Institute of America, which offers recipes and teaches essential cooking techniques. Use tools like the Partnership for Food Safety Education's Kids Games and Activities, which teach basic food safety in a fun format. Teach your children how to prepare a nutritious lunch and have them pack their school lunches each day. 100 Days of Real Food offers a section of school lunches that are nutritious and easy to prepare. Browse the section with your kids to plan their lunches for the week. Then, have your kids make a shopping list and expect them to prepare the planned lunches each day. Work with your kids to plan a family meal. Tweens are old enough to be responsible for and plan a family meal at least once per month. For help, try these free downloadable lesson plans for meal planning. In a society filled with instant gratification, there is value in learning to be patient. A study conducted in the 70s with kids and marshmallows showed that those children who were better able to delay gratification than their peers had better performance in school and had fewer behavioral issues. Later in life, those same children had higher SAT scores and were more likely to graduate college and earn a higher income. When you are teaching delayed gratification, what your child is actually learning is impulse control. Tweens with better self-control are also less likely to engage in socially or personally destructive behaviors, as well, such as bullying or cheating on a test. As with all the other life skills, your example is of utmost importance. If your children see you exhibiting self-control, they are more likely to follow suit. Likewise, as your children get older, they need to have more opportunities to control themselves with less parental involvement. Set expectations with your tweens. Work with them to determine the appropriate behaviors you will expect from them and then help them find strategies to meet those expectations. Reinforce positive behaviors with extra privileges or more trust. If you enforce consequences, use logical or natural consequences that arise naturally as a result of the behavior, and be sure the teen understands the consequences resulted from their choices. The Parenting with Love and Logic Parenting Package for ages 7-12 and the Teen Package are excellent resources. 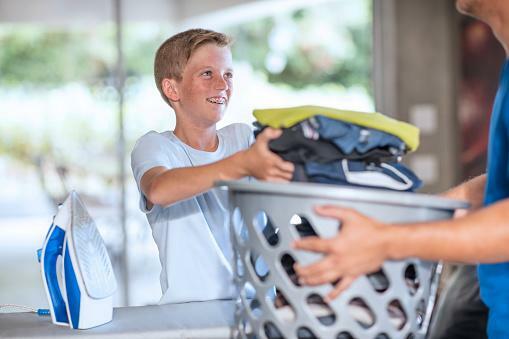 Tweens who can't perform basic laundry tasks grow up to be college students who bring home huge hampers of dirty clothes on their breaks, and nobody wants that. Fortunately, with laundry, you can start kids at a young age by having them help you sort. Then, as they get older, you can teach them to fold, and finally, you can show them how to work the washer and dryer and manage stains and laundry detergent. Real Simple offers a great laundry primer. Sit down with your child and determine how much money she will expect to earn monthly. Outline the items you expect your child to pay for (such as movies, soda, video games, etc.). Set spending restrictions - that is, things you will not allow your child to purchase even though it's his money. Then, enter income and expected expenses in a free budgeting worksheet. Require your child to track his expenses and encourage him to set aside a small amount of money to save for big-ticket items or other expenses. Some parents are comfortable leaving children as young as 8 home alone for a short period, while others prefer to wait until their children are a bit older. However, by the time they hit their tween years, most parents are comfortable leaving kids home alone at least for a few hours. Therefore, it's essential you teach kids as young as 8 what you expect of them when they are home alone, as well as teaching basic safety rules and procedures. Teach basic safety as soon as you suspect you will begin leaving your preteen home alone. Before allowing your child to stay home alone, assess her readiness. Outline your expectations and go over safety rules. Set rules for things like use of the stove, answering the phone or door, checking in with parents and others. Sit down with your child and establish a list of emergency contacts. The Red Cross has an excellent article with resources for teaching home alone safety to preteens. Come up with a safety checklist for kids who will be staying home alone and expect your child to use it anytime they are staying home without an adult. Continue to reassess the situation and discuss with your child how things went, issues, and how he could have handled any issues that arose differently. As children get older, peer pressure increases. While parents tend to worry most about peer pressure with teens, teaching your children to hold their ground with peers in their grade school and preteen years can lay the foundation for withstanding tougher challenges as your kids get older. Offer them resources like the book, Stand Up! How to Stay True to Yourself, which explores the issue of peer pressure and offers strategies. Read the book with your kids and then discuss it. Discuss your child's day with her every afternoon or evening. Ask about her challenges and how she felt about how she handled them, and offer suggestions to help her handle difficult situations. It's important to keep the lines of communication open. Educate yourself, as well. Love and Logic offers parenting tips to help your child learn to deal with peer pressure. There are a lot of adults who need to learn this skill, as well, but if you teach it to preteens, they'll be ahead of the curve. Learning how to win and lose gracefully is a social skill that will last a lifetime, help your child have better relationships, and prepare them for the sometimes hard-knock existence of adulting. Even very young children need to learn they can't win all the time, and by the time they are preteens, this lesson needs to be set in stone. After all, nobody likes a sore loser, and the older the gloating winner or angry loser is, the less attractive it is. 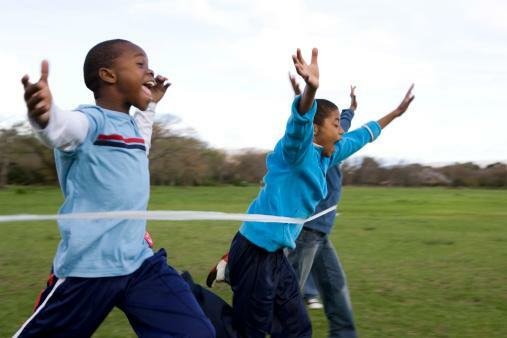 For competitive preteens, this can be especially hard, particularly if your child is one who hasn't had the opportunity to lose very much or if your child has always participated in the "everybody gets a trophy" activities. Unfortunately, the older kids get, the more competitive the world gets, and it's essential they learn to navigate competition in a graceful manner. Show good sportsmanship yourself, whether in family games or as a sideline parent watching your child's sporting events. Encourage your preteen to congratulate winners and tell losers that they played a good game or some other compliment. Instead of focusing on performance and what you thought of it, ask your child how he felt he did. Encourage your child to evaluate both the high and low points of his performance with minimal judgment. Emphasize doing their best as opposed to winning or losing. Kids are often filled with self-doubt, and confidence is a necessary trait as they navigate the teen years and beyond. Fortunately, the way you parent has a lot to do with how confident your child is. Psychology Today recommends you set aside any helicopter parenting tendencies you might have and instead, take on a coaching role in your child's life to help him build confidence. This means allowing your child to do things for himself as you stand to the side and serve as a resource. Offer your children a variety of self-esteem building activities available from Kim Petersen, MA, LPC. The US Department of Education offers a variety of resources for helping adolescents build confidence. Give your child opportunities to be successful through a series of age-appropriate responsibilities and activities, serving as a support system as needed. Today's preteens are busy! With sports, homework, family obligations and other after-school or community activities, preteens are busy and can expect to get busier. So managing their time is essential. Don't manage for them. Instead, help your preteen to find ways to manage his time with your input as required. Student Tutor offers great time management tips for tweens and teens. Kids can use apps to help them with time management. Help your child find a time management system that works for her. There are various types of planners with different focuses, so kids who plan or learn differently can find their best option. Don't forget to encourage your tween to plan some downtime where he can engage in leisure time activities, as well. There's more to learning as a preteen than math and reading. Encouraging your child to develop essential skills and practices will help her as she enters middle school and serve her well into adulthood.